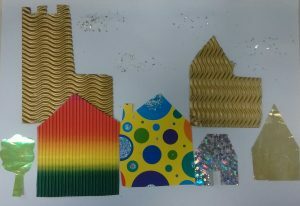 Having reached Revelation in our quick tour of the Bible, we made a heavenly city from shiny card, paper and glitter. Gold, silver, other bright shiny card, wrapping paper, etc. In advance, cut out building shapes from your paper and card. We also did a few trees and bits of river. The children should glue the buildings to their sheet of paper and decorate it with glitter to make it extra shiny.